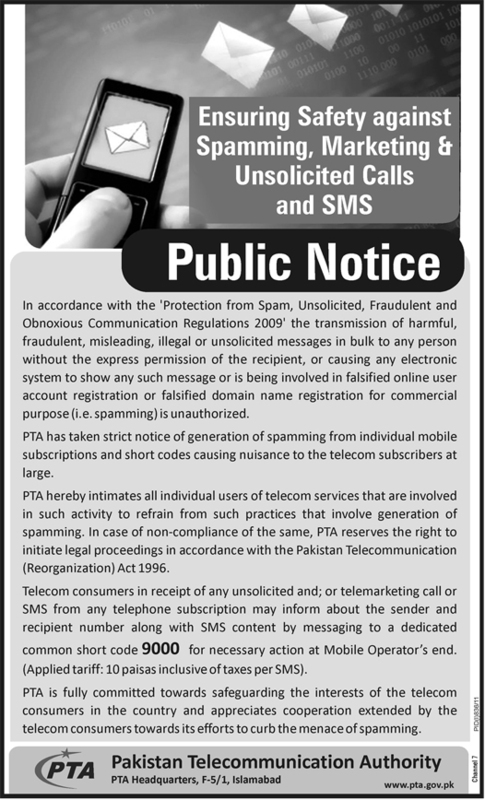 Pakistan Telecommunication Authority (PTA) warns SMS marketing and advertising Agencies to not to send unwanted and fraudulent SPAM text messages / SMS or calls to mobile phone users of Pakistan. Earlier PTCL also warned its Landline / Vfone customers about hoax calls and PTA directed all CMOs to ensure provision of Voice/SMS blocking facility. Send this information to 9000 – the complain Number of PTA. Charges: Charges for sending an SMS to 9000 are 10 paisas.